As at December 2018, New Zealand has an estimated total population of approximately 5 million. That’s an entire country with less people than many large cities (Los Angeles: +12 million, London: +10 million, Paris: +10 million). But that’s ok, we like the fact that New Zealand is relatively sparsely populated – it just means we’ve got more room to play. Thinking of visiting New Zealand for a holiday or even to stay, and want to know what the major NZ cities are and where they’re located in the country? We’ve compiled this list based on June 2018 urban area estimates from Statistics New Zealand and for the purposes of this list, we’ve defined a city as having a population of no less than 50,000, as per New Zealand’s Local Government Act. With a compact downtown and city centre, surrounded by sprawling suburbs, Auckland is New Zealand’s largest city. With a total population of just under 1.6 million, Auckland is home to around a third of New Zealand’s total population. The majority of people live in the central Auckland area followed closely by south Auckland, north Auckland (the North Shore) and Auckland’s wild west (that refers more to the landscape than the people by the way). To find out more, read our explore Auckland guide. Located at the bottom of the North Island, Wellington is both the gateway to the South Island and the capital of New Zealand. Surrounded by hills, it’s a pretty harbour city with a thriving cultural scene and a compact downtown area that’s easy to explore, filled with boutique eateries, cafes and markets. The majority of people live in the central Wellington area although the nearby areas of Porirua, Upper Hutt and Lower Hutt (technically a city itself) all form part of the Wellington urban area. You can read more about “one of the coolest little capitals in the World” in our explore Wellington guide. Located on the east coast, Christchurch is the largest city on the South Island. Still regenerating and reinventing itself after the devastating effects of earthquakes in 2010 and 2011, this vibrant city is the international gateway to the South Island and its many scenic highlights and activities. Head inland from Christchurch in any direction and you’ll have your pick of activities from walking & hiking to mountain biking and white water rafting. And in winter there’s top class skiing and snowboarding, including some exhilarating off-piste helicopter ski adventures. To find out more, read our explore Christchurch & Canterbury guide. Referred to by many as ‘The Tron’, Hamilton has long had a bad rap, particularly with Aucklanders. These days, Hamilton is expanding rapidly, filled it seems (rather ironically) with people trying to escape Auckland’s high property prices. Located on the banks of New Zealand’s longest river, The Waikato, Hamilton is known for its beautiful gardens and scenic riverside walks. It’s the largest city in the Hamilton & Waikato region, considered to be the farming heartland of the North Island, and it makes a good base from which to explore a number of popular spots including Raglan and Waitomo Caves. To find out more, read our explore Hamilton & Waikato guide. Currently one of New Zealand’s fastest growing cities, Tauranga is booming. The city is projected to grow by approximately 78,500 residents over the next 50 years. Surrounded by orchards and gardens growing everything from kiwi and citrus fruit to avocados, Tauranga is the main centre in the Bay of Plenty region. Known for its coastline which offers hundreds of kilometres of beaches, harbours and islands, the region has something for everyone, from surfing and sea-kayaking to big game fishing. To find out more, read our explore Bay of Plenty guide. Although technically two cities in their own right, Napier and Hastings are essentially right next to each other so from a population statistics perspective, they make up a single urban area. That said, being the pretty coastal city, Napier seems to get all the limelight. Generally speaking, people are more likely to say ‘hey, we’re off to Napier’ rather than ‘we’re off to see the conjoined cities of Napier-Hastings’. Napier-Hastings is the largest urban area in the Hawke’s Bay region. This sunny region in the centre of the North Island’s east coast is most famous as New Zealand’s oldest wine making region with a Mediterranean-like climate well suited to producing some fine Merlot, Cabernet Sauvignon and Syrah wines. To find out more, read our explore Hawke’s Bay guide. With an unmistakable Scottish heritage, Dunedin, New Zealand’s first official city, is rich with history, culture and, thanks to its student population, energy. The discovery of gold in the region in 1861 and the subsequent gold rush led to Dunedin becoming New Zealand’s biggest and wealthiest city. Following the gold rush, growth slowed significantly but what now remains is one of the best-preserved Victorian and Edwardian cities in the Southern Hemisphere. Dunedin is the largest urban area the region which is a popular spot for outdoor recreation, filled with wildlife, beaches and stunning scenery. To find out more, read our explore Dunedin & Coastal Otago guide. Located north of Wellington and situated on the banks of the Manawatu River, the university city of Palmerston North (‘Palmy’) is the largest centre in the Manawatu region. The rural heartland of Manawatu sits between the Tararua and Ruahine mountain ranges to the east and the Tasman Sea to the west. Palmerston North is a great base from which to explore the region’s many scenic walks, and hiking & mountain biking tracks. To find out more, read our explore Manawatu guide. Aaah sunny Nelson. This small port city regularly competes with Tauranga for having the country’s most annual sunshine hours. Located in the north western corner of the South Island, Neslon is the largest urban area in the Nelson & Tasman region. This region is home to three national parks and two Great Walks, all within easy reach of Nelson. It also happens to be New Zealand’s only hops growing region so after a hard day of hiking, paddling or cycling, you’ll be able to relax with a fine craft beer. To find out more, read our explore Nelson & Tasman guide. Rotorua offers an interesting mix of adventure and relaxation. Located on one of the world’s most lively geothermal fields, the city of Rotorua has a rather unique character with steam rising unexpectedly from drains and cracks in the ground, and a strong eggy sulphur smell in the air. Being something of an adventure capital, at least on the North Island, there’s lots to do that will distract you from the smell. Bungy jumping, jet boat rides, downhill luge, schweebing and zorbing are just some of the many activities on offer and once you’re done you can unwind in one of a number of hot pools and spas located around the town. To find out more, read our explore Rotorua guide. Whangarei is the largest urban area north of Auckland. It’s the location of New Zealand’s northernmost deep water commercial port and the country’s only oil refinery. Whangarei is also the east coast gateway to the Northland region which stretches all the way to Cape Reinga and the northernmost tip of New Zealand. To find out more about this often overlooked region, read our explore Northland guide. The port city of New Plymouth sits in the shadow of Mount Taranaki, the North Island’s second highest peak and an iconic feature of the Taranaki region. The city also sits roughly in the middle of over 150 km of rugged coastline with incredible rock formations, beautiful beaches and a number of world-class surf breaks. To find out more about this region, read our explore Taranaki guide. Invercargill is New Zealand’s southernmost city and like Dunedin, has a strong Scottish influence. The city is the largest urban area in the Southland region which is an agricultural powerhouse with thriving dairy and energy industries. The region is also known for its bird and marine life, including sea lions, penguins, dolphins, whales and, on Stewart Island, kiwis. To find out more about this region, read our explore Southland guide. 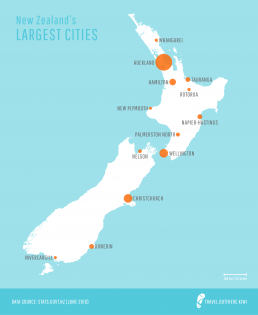 And that wraps up our list of New Zealand’s largest cities. New Zealand’s population continues to grow and the continuing trend of migration from major NZ cities towards regional hubs means that more towns will grow to become cities. Which town will be next to break 50,000? We’ll have to wait and see.